Since no genome sequences of solanaceous plants have yet been completed, expressed sequence tag (EST) collections represent a reliable tool for broad sampling of Solanaceae transcriptomes, an attractive route for understanding Solanaceae genome functionality and a powerful reference for the structural annotation of emerging Solanaceae genome sequences. We describe the SolEST database http://biosrv.cab.unina.it/solestdb which integrates different EST datasets from both cultivated and wild Solanaceae species and from two species of the genus Coffea. Background as well as processed data contained in the database, extensively linked to external related resources, represent an invaluable source of information for these plant families. Two novel features differentiate SolEST from other resources: i) the option of accessing and then visualizing Solanaceae EST/TC alignments along the emerging tomato and potato genome sequences; ii) the opportunity to compare different Solanaceae assemblies generated by diverse research groups in the attempt to address a common complaint in the SOL community. Different databases have been established worldwide for collecting Solanaceae ESTs and are related in concept, content and utility to the one presented herein. However, the SolEST database has several distinguishing features that make it appealing for the research community and facilitates a "one-stop shop" for the study of Solanaceae transcriptomes. Solanaceae represents one of the largest and most diverse plant families including vegetables (e.g. tomato, potato, capsicum, and eggplant), commercial (e.g. tobacco) and ornamental crops (e.g. petunia). Some Solanaceae plants are important model systems such as tomato for fruit ripening [1, 2], tobacco for plant defence , and petunia for the biology of anthocyanin pigments . Since no full genome sequence of a member of the Solanaceae family is yet available, though genome sequencing efforts are at the moment ongoing for tomato , potato http://www.potatogenome.net/ and tobacco http://www.tobaccogenome.org/, much of the existing worldwide sequence data consists of Expressed Sequence Tags (ESTs). Because of the useful information these data bring to the genomics of Solanaceae plants, the availability of EST collections has dramatically increased in size, partly thanks to the start-up of sequencing initiatives . EST collections are certainly no substitute for a whole genome scaffold. However, they represent the core foundation for understanding genome functionality, the most attractive route for broad sampling of Solanaceae transcriptomes and, finally, a valid contribution to comparative analysis at molecular level on the Solanaceae family members. ESTs are a versatile data source and have multiple applications which result from the specific analytical tools and methods accordingly used to process this type of sequence. Therefore EST databases are useful not only to strictly serve as sequence repositories, but as powerful tools, albeit relatively under-exploited and far from complete. 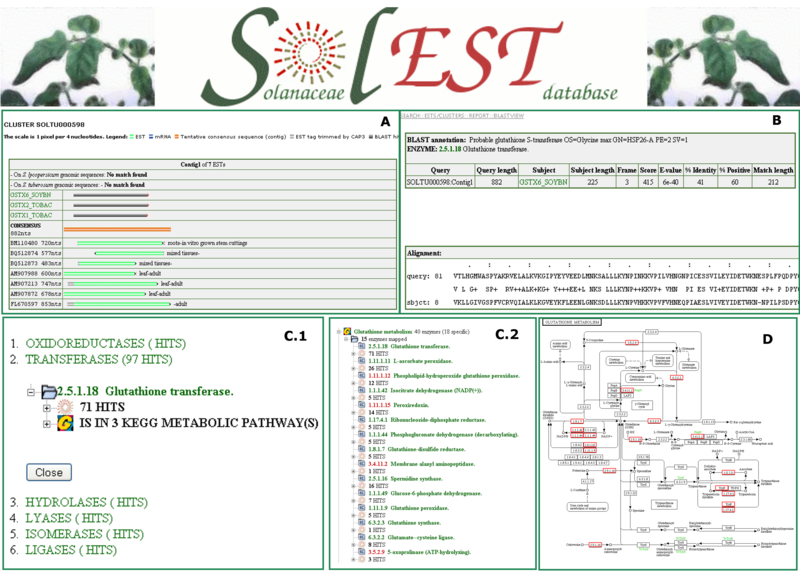 Several web resources have been established for collecting ESTs and for improving and investigating their biological information content due to the growing interest in Solanaceae genomics research. Some of them, mainly focusing on individual species, address the needs of a particular research community by providing a catalogue of putative transcripts, describing their functional roles and enabling gene expression profiling [7, 8]. The remaining represent data-gathering centres or rather comprehensive resources aiming to meet the challenges raised by the management of multiple information from diverse sources worldwide [9–11]. The ultimate goal of these gene index providers is to represent a non-redundant view of all EST-defined genes. The unigene builds, which emerge, serve as the basis for a number of analyses comprising the detection of full-length transcripts and potential alternative splicing, expression pattern definition, association to array probes and, as a consequence, to microarray gene expression databases; association to metabolic and signalling pathways; development of simple sequence repeat (SSR) and conserved ortholog set (COS) markers etc. We present the SolEST database, which integrates different EST datasets from both cultivated and wild Solanaceae species and also two EST collections from Rubiaceae (genus Coffea). SolEST is built on the basis of a preceding effort which was centred on the investigation of ESTs from multiple tomato species . The main purpose is corroborating the existing transcriptomics data which are part of the multilevel computational environment ISOL@ . In addition, the Solanaceae EST-based survey can considerably contribute to genome sequence annotation by highlighting compositional and functional features. Indeed, SolEST is a valuable resource for the ongoing genome sequencing projects of tomato (S. lycopersicum)  and potato (S. tuberosum; http://www.potatogenome.net/) and has the potential to significantly improve our understanding of Solanaceae genomes and address sequence-based synteny issues. A common complaint in the SOL community concerns the different unique transcript sets generated for a given Solanaceae species by diverse research groups. These worldwide resources [9–12] are built starting from different primary data sets and by applying diverse methods and user-defined criteria for sequence analysis. Of course, there are advantages and disadvantages associated to each set, but to our knowledge, there is currently no easy way to compare them and, as a consequence, to provide the scientific community with a comprehensive overview. To this end, we also propose, as a novel feature of the SolEST database, a combined resource/interface dedicated to enabling the combination of different unigene collections for each Solanaceae species based on the UniProt Knowledgebase annotations. The collection and integration of the whole public dataset of Solanaceae ESTs facilitate a "one-stop shop" for the study of Solanaceae transcriptomes. EST sequences are downloaded from dbEST http://www.ncbi.nlm.nih.gov/dbEST/ and from the Nucleotide/mRNA division of GenBank (release 011008). 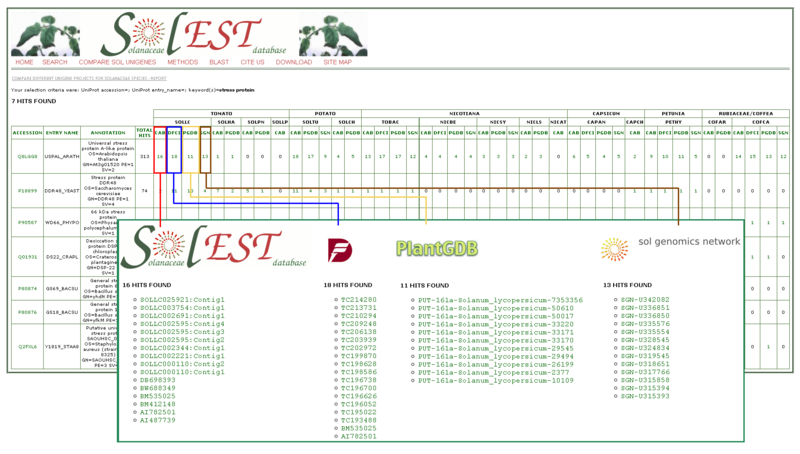 The EST processing and annotation pipeline is described in  although it has been recently upgraded by updating the set of databases used in EST vector cleaning and repeat masking and in the annotation phase. In addition, the clustering tool was replaced with a more efficient novel method presented in . This pipeline, divided into four consecutive steps, was used for processing EST data from 14 cultivated and wild Solanaceae species and from two species belonging to the genus Coffea (Table 1). Source: SOLLC: S. lycopersicum; SOLPN: S. pennellii; SOLHA: S. habrochaites; SOLLP: S. lycopersicum × S. pimpinellifolium; SOLTU: S. tuberosum; SOLCH: S. chacoense; TOBAC: N. tabacum; NICBE: N. benthamiana; NICSY: N. sylvestris; NICAT: N. attenuata; NICLS: N. langsdorffii × N. sanderae; CAPAN: C. annuum; CAPCH: C. chinense; PETHY: Petunia × hybrida; COFCA: C. canephora; COFAR: C. arabica. #ESTs: number of raw ESTs from dbEST; EST length: average length and standard deviation; #mRNA: number of mRNA from GenBank;mRNA length: average length and standard deviation; #cluster: number of clusters created by grouping overlapping EST sequences; #TCs: number of tentative consensuses which are generated from multiple sequence alignments of ESTs (assembling process); TC length: average length and standard deviation; #ESTs in TCs: number of ESTs assembled to generate TCs; #sESTs:number of singleton ESTs; sESTs length: average length and standard deviation;#Unique transcripts: number of total transcripts obtained adding the sESTs to the TCs. RepeatMasker http://repeatmasker.org is used to identify and mask vector sequences by using the NCBI's Vector database (ftp://ftp.ncbi.nih.gov/blast/db/FASTA/vector.gz; update October 2008). The masked regions are removed with an in-house developed trimming tool. EST sequences are masked using the RepeatMasker program with the RepBase.13.06 http://www.girinst.org/ as selected repeat database. Targets for masking include low-complexity regions, simple sequence repeats (SSR, also referred to as microsatellites) and other DNA repeats (e.g. transposable elements). For each collection the rate of sequence redundancy was evaluated by first clustering, then assembling EST reads to produce tentative consensus sequences (TCs) and singletons (sESTs; see Table 1). The wcd tool  was used with its default parameters for the clustering process. The CAP3 assembler  with overlap length cutoff (= 60) and an overlap percent identity cutoff (>85) was run to assemble each wcd cluster into one or more assembled sets of sequences (i.e. TCs). Indeed, when sequences in a cluster cannot always be all reconciled into a solid and reliable multiple alignment during the assembly process, they are divided into multiple assemblies/TCs. Possible interpretations are: (i) alternative transcription, (ii) paralogy or (iii) protein domain sharing. All the ESTs that did not meet the match criteria to be clustered/assembled with any other EST in the collection were defined as singleton ESTs. Functional annotation, which is performed both on EST sequences and TCs, is based on the detection of similarities (E-value ≤ 0.001) with proteins by BLAST searches versus the UniProtKB/Swiss-prot (Release 14.3) database. BLAST annotation is detailed including fine-grained gene ontology terms http://www.geneontology.org/ and Enzyme Commission numbers http://www.expasy.ch/enzyme/. A back-end tool to align on-the-fly the unique transcripts against the annotated KEGG-based metabolic pathways http://www.genome.jp/kegg/ was also implemented. Raw input ESTs, intermediate data (from the pre-processing analysis) as well as transcript assembly data and annotation information were stored in a MySQL relational database whose structure reproduces the one described in . Web interfaces were implemented in dynamic PHP pages and include Java tree-views for easy object navigation (http://biosrv.cab.unina.it/solestdb/; Figure 1). In addition to well-established access to the EST-based resources via web interfaces, all sequence datasets are available for bulk download in FASTA format in a typical web-based data exchange scenario on the web http://biosrv.cab.unina.it/solestdb/download.php. Snapshots of the SolEST database web interface. A: TC structure and functional annotation. B: BLASTx alignment to protein. C1: Data classification by ENZYME scheme. C2: Data classification by KEGG metabolic pathways. D: Transcript association to KEGG metabolic maps. EST and mRNA sequences were explored for the existence of microsatellite repeat motifs since they are potential resources for SSR marker discovery [17, 18]. Our research focused on trimeric, tetrameric, pentameric and hexameric repeat motifs. In the entire collection we found 10 trimeric, 28 tetrameric, 88 pentameric and 16 hexameric motifs. SSR summary statistics are reported in Table 2, while the frequency of different types of SSR motifs, which were identified species by species, can be found in Additional file 1. In Figure 2, we report the average repeat length and the standard deviation for each SSR motif. Simple Sequence Repeats (SSR) summary statistics. Source: SOLLC: S. lycopersicum; SOLPN: S. pennellii; SOLHA: S. habrochaites; SOLLP: S. lycopersicum × S. pimpinellifolium; SOLTU: S. tuberosum; SOLCH: S. chacoense; TOBAC: N. tabacum; NICBE: N. benthamiana; NICSY: N. sylvestris; NICAT: N. attenuata; NICLS: N. langsdorffii × N. sanderae; CAPAN: C. annuum; CAPCH: C. chinense; PETHY: Petunia × hybrida; COFCA: C. canephora; COFAR: C. arabica. For each species we show the number of the sequences analysed, the number of the microsatellites identified, the total of the SSR-containing sequences and the amount of sequences containing more than one SSR. We considered the most accessed and referenced Solanaceae unigene collections freely available on the web [9–11] in an effort to enable comparisons of different unigene projects for a given species by a comprehensive approach. Different Solanaceae and Rubiaceae (genus Coffea) expressed unique transcript sets from the DFCI Gene Index Project (DFCI; http://compbio.dfci.harvard.edu/tgi/plant.html), the plantGDB (PGDB; http://www.plantgdb.org/download/download.php?dir=/Sequence/ESTcontig) and the Solanaceae Genome Network (SGN; ftp://ftp.sgn.cornell.edu/unigene_builds/) were downloaded. In Table 3 the number of collected sequences per species is reported for each of the resources taken into account. Each dataset was compared versus the UniProtKB/Swiss-prot (Release 14.3) database using BLASTX (e-value = 0.001) and the corresponding results are summarized in Table 4. A total of 29,463 distinct proteins were matched corresponding to ~7.35% of the whole protein collection made up of 400,771 sequences. 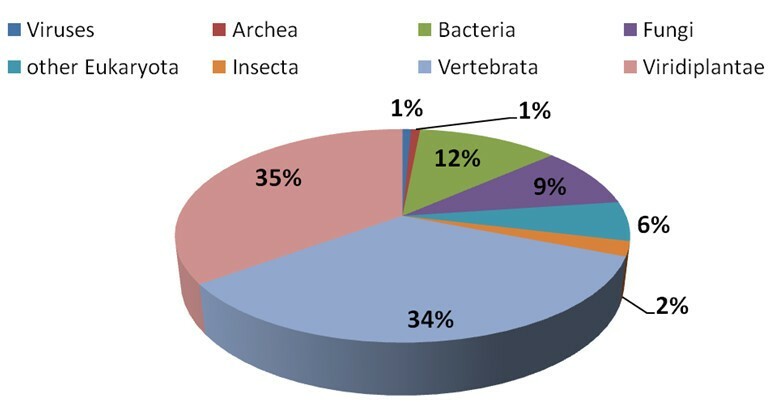 When considering annotations with respect to the origin of the protein data source, the bulk of the identifications concerned proteins of plant and vertebrata origin (35% and 34%, respectively), while protein from bacteria and fungi represent 12% and 9% as reported in figure 3. We built a web tool dedicated to enable the association of different unigene collections for a given Solanaceae species based on the UniProt Knowledgebase annotations. Data can be accessed by specifying the UniProt accession number, the UniProt entry name or keywords; the latter may be searched in the protein description lines http://biosrv.cab.unina.it/solestdb/solcomp.php. Number of sequences per species collected from different web sources. Source: SOLLC: S. lycopersicum; SOLPN: S. pennellii; SOLHA: S. habrochaites; SOLLP: S. lycopersicum × S. pimpinellifolium; SOLTU: S. tuberosum; SOLCH: S. chacoense; TOBAC: N. tabacum; NICBE: N. benthamiana; NICSY: N. sylvestris; NICAT: N. attenuata; NICLS: N. langsdorffii × N. sanderae; CAPAN: C. annuum; CAPCH: C. chinense; PETHY: Petunia × hybrida; COFCA: C. canephora; COFAR: C. arabica.CAB: Computer Aided Bioscience group http://cab.unina.it collection; DFCI: The DFCI Gene Index Project http://compbio.dfci.harvard.edu/tgi/; PGDB: PlantGDB http://www.plantgdb.org/; SGN: The unigene collection at Solanaceae Genomics Network http://www.sgn.cornell.edu/. '?' indicates that the corresponding sequence file was corrupted at the time of the analysis. The table shows the number of sequences with significant matches to the UniProtKB/Swiss-prot database and, in brackets, the corresponding percentage on the total. Source: SOLLC: S. lycopersicum; SOLPN: S. pennellii; SOLHA: S. habrochaites; SOLLP: S. lycopersicum × S. pimpinellifolium; SOLTU: S. tuberosum; SOLCH: S. chacoense; TOBAC: N. tabacum; NICBE: N. benthamiana; NICSY: N. sylvestris; NICAT: N. attenuata; NICLS: N. langsdorffii × N. sanderae; CAPAN: C. annuum; CAPCH: C. chinense; PETHY: Petunia × hybrida; COFCA: C. canephora; COFAR: C. arabica.CAB: Computer Aided Bioscience group http://cab.unina.it collection; DFCI: The DFGI Gene Index Project http://compbio.dfci.harvard.edu/tgi/; PGDB: Plant Genome Database http://www.plantgdb.org/; SGN: The unigene collection at Solanaceae Genomics Network http://www.sgn.cornell.edu/). Pie chart representing protein annotations with respect to the origin of the protein data source. The results of a query are displayed in matrix format where each row represents a protein and each column refers to a single species for each web resource. The (i, j)th entry of the matrix identifies the number of unique transcripts matching a protein sequence (Figure 4A). By clicking on a single matrix cell the user can access the list of source-specific sequence identifiers (Figure 4B), each of which is, in turn, used to generate a cross-reference to the SolEST database itself as well as to the corresponding external database. Screenshot of the web tool for comparing different unigene collections for a given Solanaceae species. Panel A shows results from a query in matrix format where each row represents a protein from the UniProt Knowledgebase database and each column refers to a single Solanaceae species and unigene collection. Each matrix cell defines the number of unique transcripts matching a protein sequence. By clicking on a single matrix cell the user can access the list of source-specific sequence identifiers (Panel B). EST-based collections represent a much-needed reference for the structural annotation of the emerging Solanaceae genome sequences and for addressing sequence-based synteny studies. In addition, they can support technical issues arising while sequencing efforts are ongoing. 1,215 BAC sequences from S. lycopersicum and 708 from S. tuberosum were retrieved from GenBank on July 2009. ESTs and TC sequences from tomato and potato were spliced-aligned along BAC sequences using GenomeThreader . Alignments with a minimum score identity of 90% and a minimum sequence coverage of 80% were filtered out. Table 5 shows the number of ESTs and TCs per species successfully mapped along the available BAC sequences from tomato and potato (see Methods). Counting of ESTs/TCs mapped along tomato and potato genomic sequences. The total number of ESTs/TCs for each Solanaceae species collected in the SolEST database is shown in the first two columns. The number of ESTs/TCs splice-aligned along BACs, the number of ESTs/TCs mapped more than once and the number of EST/TC single matches is reported for the tomato and potato genomes, respectively. In addition, the table lists the number of ESTs/TCs exclusively mapped onto the tomato or potato genome and, finally, the number of ESTs/TCs splice-aligned along both the genomes. We estimated the level of coverage of the Solanaceae transcriptome by counting the number of ESTs/TCs mapped with respect to the total number of the sequences collected in SolEST. 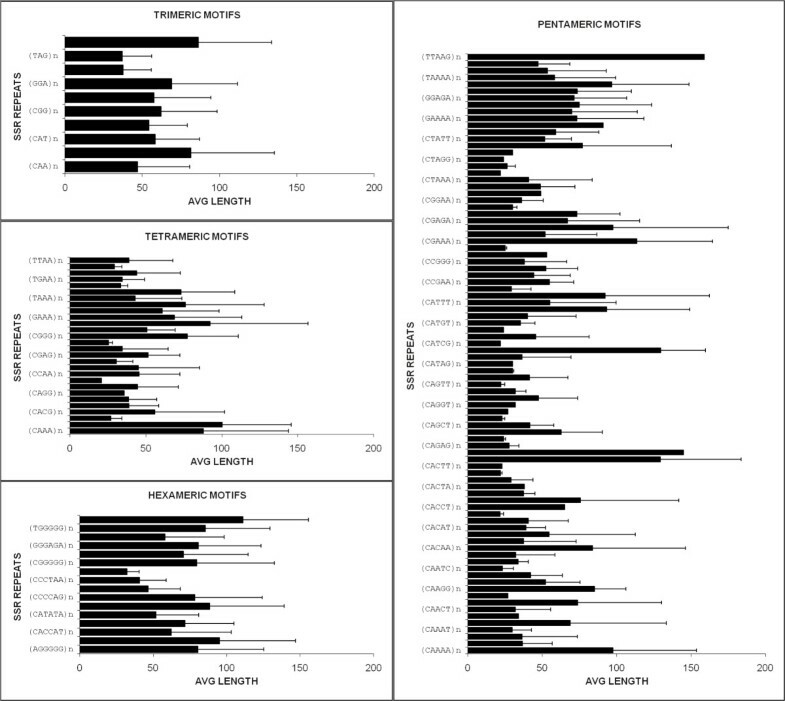 The different transcriptome coverage per species is informative per se of the similarity level of the Solanaceae transcriptomes. For example, the EST/TC dataset from tobacco (Nicotiana tabacum), even if it is solid in number, proved poorly mapped on both tomato and potato BACs, showing a transcriptome distance with respect to S. lycopersicum, S. tuberosum or C. annuum. Columns 4 and 7 in Table 5 report the number of ESTs/TCs with multiple matches along tomato as well as potato BACs. This is expected since sequencing proceeds on a BAC-by-BAC basis, aiming at a minimal tiling path of BACs. In other words, it is evident that several transcripts are aligned along different BACs of the same chromosome because of BAC overlaps. As an alternative, transcripts with multiple matches can be identified with repetitive sequences in the genomes. Table 6 shows that concurrent mapping of Solanaceae ESTs/TCs along the tomato and potato BAC sequences is informative not only for investigating genome co-linearity between the two species but also for supporting genome sequencing and assignment of BACs to the corresponding chromosomes. Examples of S. lycopersicum TCs that are independently splice-aligned along tomato and potato BACs. Each selected TC is identified by its ID (TC ID), and a putative functional annotation is associated to it (UniProtKB Annotation). In case of TCs aligned along S. lycopersicum and/or S. tuberosum BACs, the chromosome number (# chr), the BAC accession number from GenBank (BAC ID), and the BAC start and stop coordinates are reported. First of all, panels A and B in table 6 report instances of S. lycopersicum TCs solely mapped on BACs from a unique species. In particular, 5,904 S. lycopersicum TCs mapped exclusively on tomato genome sequences, while 488 were successfully aligned only along potato BACs, suggesting that the potato sequencing project, although started later, is providing a complementary contribution to that of tomato. Tomato as well as potato BACs with ambiguous positioning on chromosomes, which have been assigned to the arbitrary-defined chromosome 0, can be correctly associated to the corresponding chromosomes by exploiting (Table 6, panels C and D) evidence from the potato or tomato counterpart, respectively. In most cases, it is useful to refer to a comparison of BAC sequences, while they are released, in an attempt to find clear genome co-linearity with tomato/potato (Table 6 panels E) or to highlight neighboring genetic loci which retain their relative positions and orders on different chromosomes of the two species (Table 6 panel F). Figure 5 shows an example that points to the power of a comparative approach based on different transcriptome and genome collections integrated in a single platform. Transcripts from S. lycopersicum and S. tuberosum were mapped onto the BAC CU914524.3 from tomato and the BAC AC233501.1 from potato. The two BACs are present schematically at the center of the figure and were selected because they share a remarkable number of TCs (20 TCs) which are represented as colored bars (the same colors identified the same TCs). Clearly, all the TCs successfully aligned along the BAC CU914524.3 are mapped onto the potato BAC AC233501.1 maintaining their relative positions and orders. It can be easily assumed that the two genomic regions taken into account are co-linear. However, they differ in size, the potato genomic region being 120 kb and that of tomato 70 kb. This is due to insertions in the potato BAC. In these inserted regions TCs from both the species are present (black bars). The region which we are describing is highlighted in yellow and is "zoomed-in" in order to display details on the TC splice-alignments. Representation of the co-linearity between the tomato BAC CU914524.3 and the potato BAC AC233501.1. The BAC CU914524.3 from tomato and the BAC AC233501.1 from potato are present schematically at the center of the figure. Transcripts from S. lycopersicum and S. tuberosum mapped onto them are represented as colored bars (same colors identified same TCs). 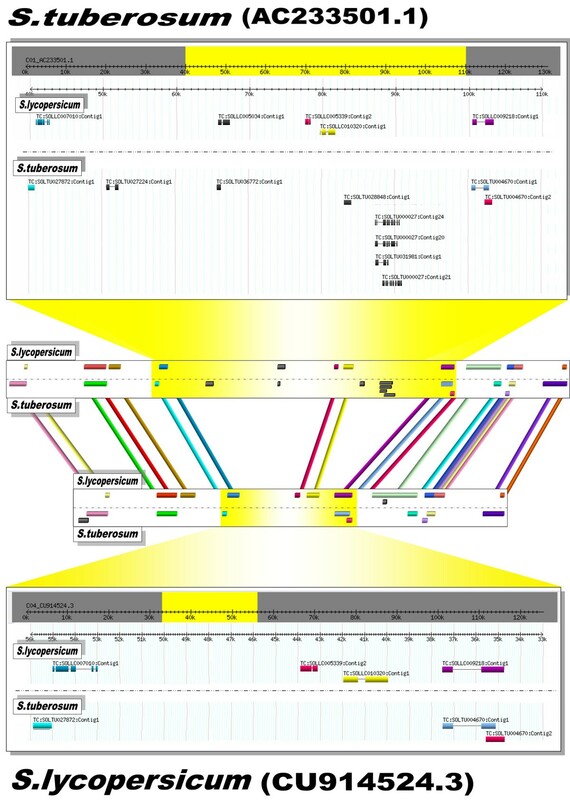 A particular genomic region is emphasized in yellow and is "zoomed-in" in order to display details on the TC splice-alignments. SolEST currently provides information on the mapping of both EST and TC datasets on the draft sequences of the tomato and potato genome in the framework of platform ISOL@ . Different databases worldwide are related in concept, content and utility to the one presented herein. All of them aim to partition EST sequences into a non-redundant set of gene-oriented clusters and to provide sequences with related information such as biological function and the tissue types in which the gene is expressed. Of course, they differ in their database update policy, in data quality standards and finally in the level of detail with which the database is endowed, which supports investigations on structural and functional information and on expression patterns to different extents. Being in possession of the entire publicly available EST collection for Solanaceae permitted identification of SSR and the building of a comprehensive EST-derived SSR catalogue for Solanaceae which is accessible to users. This catalogue can be used to develop genetic markers, opening up additional paths into Solanaceae phylogenetic and evolutionary analysis and genetic mapping. Another novel feature of the SolEST database is aimed at resolving a common complaint in the SOL community as to whether different Solanaceae assemblies generated by diverse research groups should be compared. Various clustering and assembly programs or parameters result in differences among the unique transcript sets provided by different reference databases. In addition, given that each set can be built starting from non-homogeneous primary data sources (e.g. dbEST, RefSeq, genomic or unfinished high-throughput cDNA sequencing (HTC) entries), differences can further become larger. The different major collections now available for the Solanaceae transcriptomes are however equivalently used by the entire community, as they represent the basic collection for specific expression arrays (e.g. a list of microarray resources for tomato is available in  Table 2), for COS marker definition , for genome annotation . In order to overcome such differences, we decided to compare each unigene collection with the UniProt Knowledgebase. The use of a protein reference database may represent a useful tool to cross-link the different collections through a specific service and, more interestingly, it is an immediate approach to compare the different EST-based available resources. One of the most novel features in SolEST, when compared to other resources, is the option of accessing and then visualizing Solanaceae EST/TC alignments along the tomato and the potato genomes. The mapping of Solanaceae ESTs certainly provides insights into the location of potential candidate genes and facilitates EST-driven gene annotation. This represents the first attempt to provide a unique view of the data from both the sequencing efforts, which we believe will be appreciated by the SOL community. In addition, having ESTs from Solanaceae and Rubiaceae mapped along the genomes of two of the major representatives of the family will support comparative genomics approaches aimed at addressing the most fundamental issues such as diversity and adaptation within the Solanaceae family and heterogeneity in gene expression patterns. Finally, the TCs we defined will provide support for solving technical issues arising from BAC-by-BAC genome sequencing and will undoubtedly provide a reference for forthcoming WGS (whole genome shotgun) efforts in both tomato and potato. To our knowledge, no similar work has yet been carried out on the construction of an EST database offering a broad overview of Solanaceae as well as Coffea transcriptomes. Multiple sequence analysis results from the database (e.g. developing a unigene set, annotation with putative function and identification of SSRs) extensively linked to external related resources, represent a major source of information for these plant families, opening up novel vistas conducive to comparative evolutionary studies. We think the SolEST database will represent an invaluable resource for supporting the structural annotation of the emerging Solanaceae genome sequences and addressing technical issues arising while sequencing efforts are being made. Finally, the SolEST database meets the challenge of connecting the different EST-centered collections worldwide generated by applying various methods and starting from disparate primary data sources. The SolEST database is available with no restrictions at the following URL: http://biosrv.cab.unina.it/solestdb/. The SolEST update is scheduled at the end of each year and comprises the retrieval of primary data sources (i.e. EST/mRNA sequences) and the generation of novel unigenes/TCs as well as their annotation. Therefore, at each release the update of the satellite databases (i.e. UniVec, RepBase, UniProtKB/Swiss-prot, Gene Ontology, Enzyme, KEGG) used in the cleaning, repeat masking and annotation phases is also performed. The retrieval of new S. lycopersicum and S. tuberosum BAC sequences from the GenBank repository is ensured daily by an automated pipeline . The switch to genome contigs will beensured as the sequencing status will evolve. The authors thank Mark Walters for editing the manuscript. This work is supported by the EU-SOL project (European Union) (Contract no. PL 016214-2) and by the GenoPom Project (MIUR, Italy). This is the contribution DISSPAPA no. 2000. NDA was mainly involved in the development, organization and maintenance of the SolEST database and wrote the manuscript; AT was involved in setting up the comparative analysis of the genome sequences from tomato and potato; LF contributed to carrying out the project; MLC conceived the project, directed its design and implementation, coordinated the different efforts and wrote the manuscript. All authors read and approved the final manuscript.